The goal: hack the phones of the most influential and creative people in advertising, at the biggest ad event of the year. After placing 2nd in the US Young Lions competition with Claire, we squirreled a way to go to Cannes Lions (hack #1). Next, we decided to use this opportunity to launch a side project--for good. We noticed there weren't any talks on the #MeToo Movement and Time's Up and were shocked. Honestly, how do you not address sexual harassment in a post-Cosby age?? After some ideating, we came up with Unsolicited AirDrop. 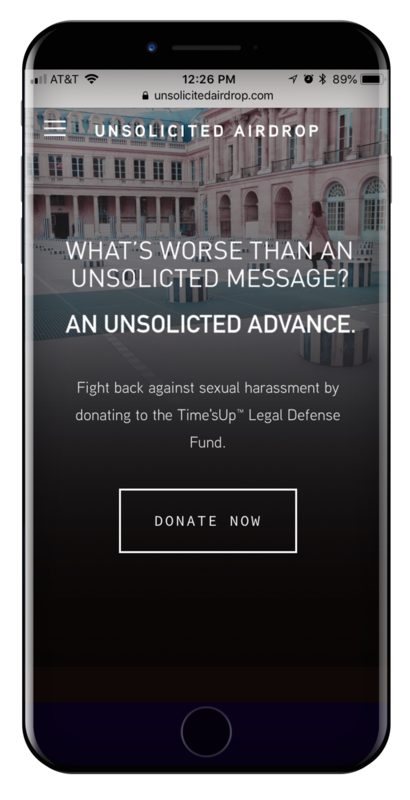 Using the oft-forgotten feature on iPhones, we figured we could serve up an intrusive pop-up (mimicking an unwanted advance) and use it as a CTA to donate to the Time's Up Legal Defense Fund. And you know what? People actually accepted. Everywhere we went, we AirDropped it like it was hot. We heard people talking about it. We showed creatives who were really impressed. And we even dropped it to a TV at Facebook Beach (hack #2). Instructions at the bottom of the site also showed people how to change their name and do Unsolicited AirDrop with us. For just the 5 days we were there, we had 200+ unique visitors from 15 different countries--and even got some Peggy Olsons send it back to us.